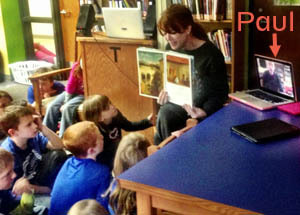 Paul spent a period in conversation with the second graders at Van Meter School in Van Meter, Iowa. That is, the students were there; Paul was in his studio in Brooklyn. So he was able to pull things off of shelves and out of drawers to show them. 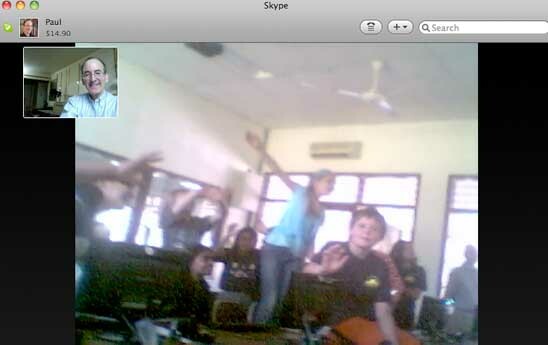 You can read librarian Shannon Miller's blog about the Skype visit here. And you can follow her on Twitter: @shannonmiller. For that matter, follow Paul, too: @paulozelinsky. A Package arrives from The Horn Book: These photos document the arrival and opening of the March/April 2013 issue of The Horn Book (a highly respected journal of essays and reviews about children's literature) featuring Paul's own watercolor on the cover, and a very complimentary article about him on the inside. Click on a thumbnail to see the larger photo, and read caption and comments. Here is a link to the article. Paul O. Zelinsky in Bologna Paul and his wife visited Italy with illustrator Bob Barner and his wife. The four of them spent three days in Bologna to attend the Bologna Book Fair. 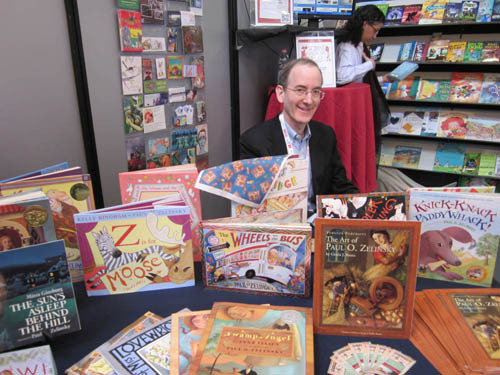 On one day Paul was given a table at the SCBWI stand, where his books were spread out for people to see. More interesting was the Illustrators Duel that he and Bob put on. It was very popular. Here is one blog's take on it. Over the Moon: the Broadway Lullaby Project is the name of a book/ebook/musical album of lullabies written by prominent Broadway composers and lyricists at the request of organizers Jodi Glucksman and Kate Dawson, a project to support breast cancer research and education (proceeds will be divided equally between Young Survival Coalition and Breast Cancer Research Foundation). As a book, Over the Moon will have a CD bound into it, with lullabies sung by noted Broadway performers. 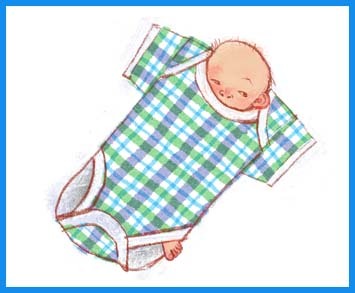 Paul's contribution to this work is an illustration of a song called "Onesie" written and sung by B.D. Wong. This picture is a little spot drawing that lies across from the full-page illustration. 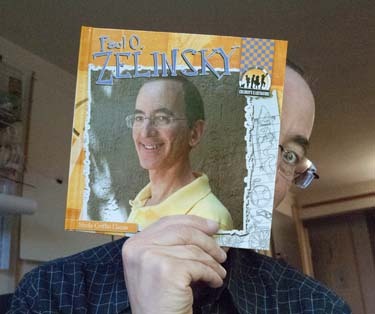 Paul O. Zelinsky is a book! Abdo Publishing has produced an easy-to-read Paul O. Zelinsky reference book, with a lot of pictures. School libraries might like it, and anybody can find it at abdopublishing.com. It's a short read (24 pages including front and back matter) but fascinating! Other illustrators featured in Abdo's Childen's Illustrators series include Ezra Jack Keats, Robert McCloskey, Garth Williams, William Steig, Jerry Pinkney and more. Knick-Knack Paddywhack! 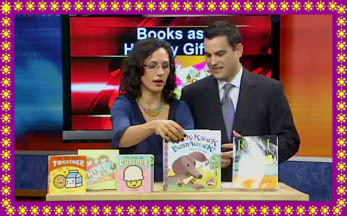 was brought on Connecticut television by children's book author/illustrator, blogger, and literacy-proponent-extraordinaire Katie Davis (visit her blog here). It's always great when television pays attention to children's books; it should happen more often. If you go to WTNH's web page for this segment, please leave a comment, so the station will know that their paying attention is getting some attention! Check out this blog on the Publishers Weekly website. One warm November morning, Paul spoke about making art, along with artists Marla Frazee and Stephen Savage, at the Society of Illustrators' Original Art Show. This article does a good job of conveying what each speaker contributed. Check out this blog, too. 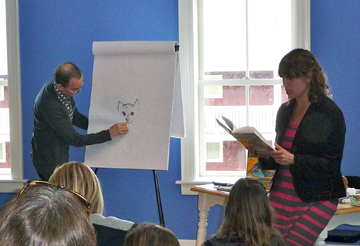 This PW blog is a wonderful account of a presentation Paul and Emily Jenkins gave at The Flying Pig Bookstore in Vermont, about Toys Come Home. Bookstores and schools around the country have reacted very enthusiastically to their presentations about the Toys trilogy. 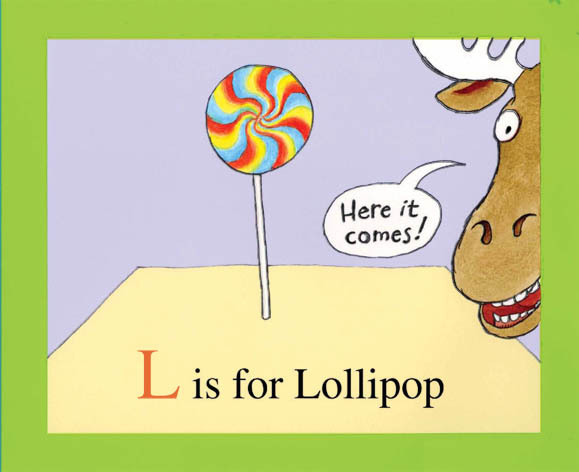 Z is for Moose arrived in 2012. A picture book by Kelly Bingham, it's not quite an alphabet book, although responsible Zebra is valiantly trying to arrange things so that it is. 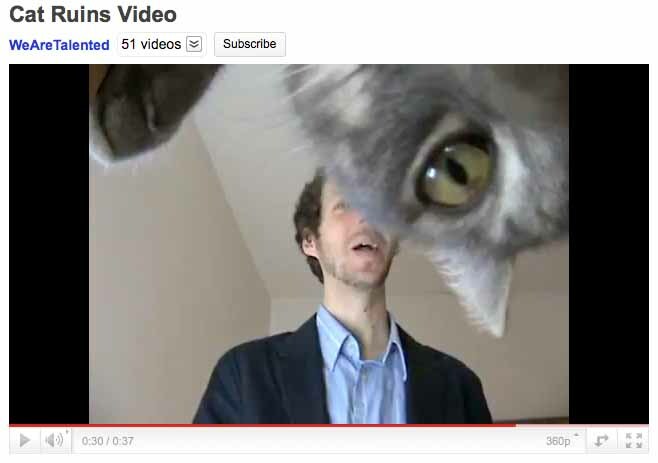 Apple, Ball and Cat are ready to cooperate, but Moose is another matter. Z is for Moose is a story about frustration and friendship and it's very funny. with a meant-to-be-silly message suggesting there could be plagiarism here. Before seeing the video, Virginia was very alarmed..
Paul visited with students at the Mountainview International Christian School in Salatiga, Indonesia. 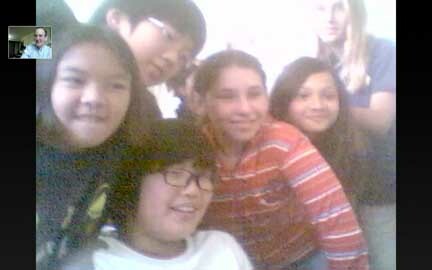 They had many good questions, and it seemed that a good time was had on both sides of the world. Then the children began the first day of their last week of the school year, and Paul went home to bed. 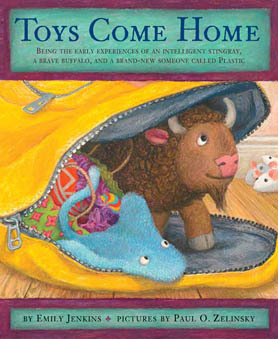 A new book: Toys Come Home, by the inimitable Emily Jenkins, completes the Toys Go Out trilogy. Emily's immensely popular Toys Go Out was followed by its sequel, Toy Dance Party. Toys Come Home takes place earlier, before the other two books. But it doesn't have to be read first in the series. Toys Come Home will reveal answers to many of the tantalizing questions you may have had after reading the other books, such as: why was the one-eared sheep a one-eared sheep? A Page on this website is devoted to the planting of Rapunzel seeds. Take a look.